IN STOCK. This item usually ships in one day. Official Summer Sailstice Graphic Tee. Make the Summer Sailstice a day of family and club sailing at your unique angle to the sun! 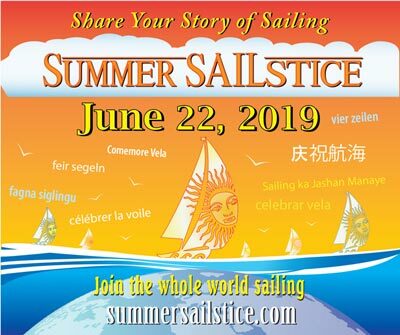 A worldwide celebration of sailing on the weekend closest to the solstice. Find an event near you, or be the spark and organize an event yourself. You can win prizes by entering one of our many contests. Add your sailing plans and you could win a cruise in the Caribbean or any of dozens of other prizes! Big fan of Summer Sailstice and this T-shirt design is great!